See the the most famous star homes in the world on this 2 hour day or night tour of Hollywood, Mulholland Drive, Beverly Hills, Rodeo Drive, and the Sunset Strip! Justin Bieber, Kim Kardashian, Tom Cruise, Bruno Mars, Elton John, Jennifer Lopez. 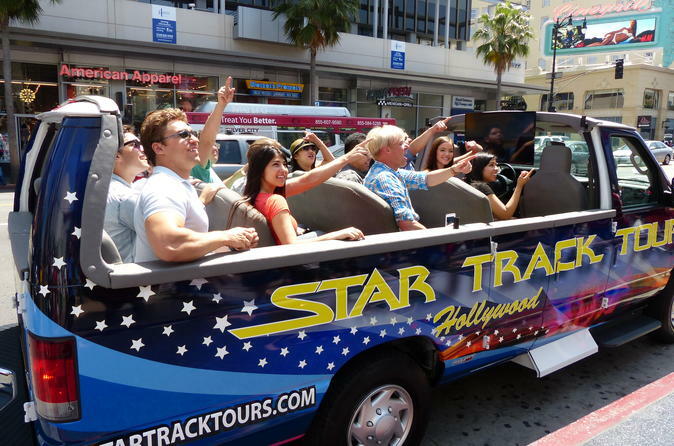 It's the best tour in Hollywood. You will start in Hollywood on the fabulous Walk of Fame. Then drive up to the top of Mulholland Drive and view the famous Hollywood Sign. Then off to the incredible mansions of Beverly Hills. You will see inside and outside the homes thanks to our onboard TV's. Travel down Rodeo Drive and then back along the fabulous Sunset Strip past world famous hotels, bars, and restaurants. Finally end up back in Hollywood and see the home of the Oscars and the incredible historic Chinese Theatre! It's an experience you will never forget!